Celiac Disease is Genetic: Are You at Risk? Do you have a family member with Celiac Disease? You should be tested too! Certainly one of the perks of cooking a full Thanksgiving meal is the amount of leftovers that can serve you for several days afterward. I’m not a huge turkey fan, but I did insist we roast one. With only eight people at our Thanksgiving dinner table this year, we still had quite a bit of turkey left over. 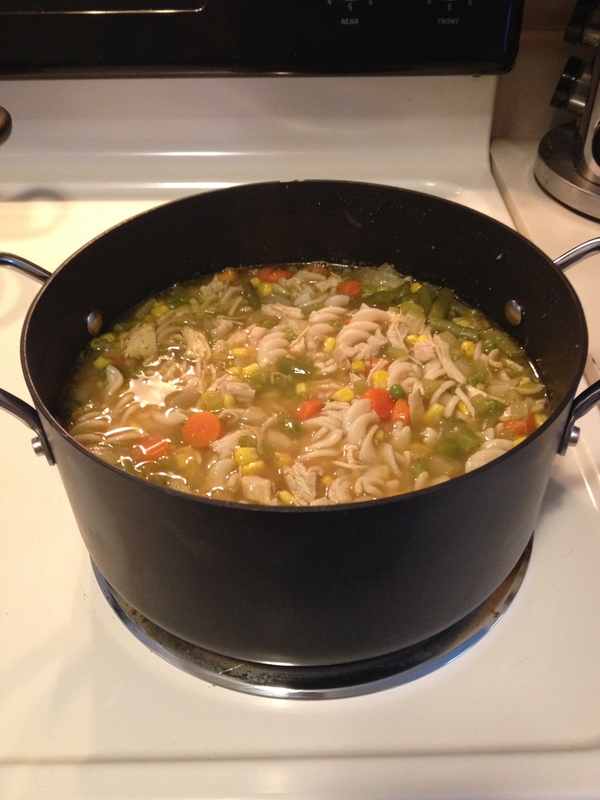 To keep it from going to waste, I made my very own turkey noodle soup. Although I like to cook, I’m not usually one to experiment in the kitchen. I like following recipes because it’s almost guaranteed that the meal will turn out okay. But after searching for a gluten free turkey noodle soup recipe and finding few results that sounded easy or tasty, I decide to wing it and make my own. Follow package instructions to boil pasta and steam vegetables. In a stock pot, heat olive oil over medium heat. Stir in celery and onion, adding Mrs. Dash Table Seasoning. Saute vegetables until tender. Add steamed vegetables, turkey, and spiral noodles. Stir in chicken broth, dripping, and water. Sprinkle in additional Mrs. Dash Table Seasoning and salt until desired. Bring soup to a boil and then let simmer on low heat. Serve soup warm with your favorite toasted gluten free bread and butter! 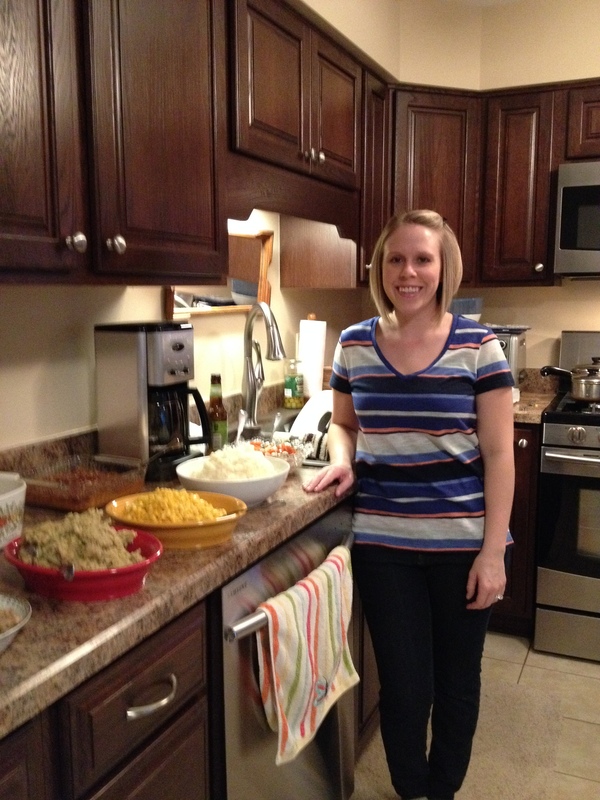 A few months ago, my husband and I decided on a new tradition: each major holiday, we’d cook a gluten free meal to celebrate together and take the left-overs to the celebrations we’d have with our families. This Thanksgiving, we had the usuals: steamed corn, mashed potatoes, cranberry, a roasted turkey, but in the spirit of thankfulness and reciprocation, I’d like to share some of our menu. I hope you’ll find these recipes helpful next time you plan a holiday meal! Note: The recipes included here were modified to be gluten free, but please check all ingredient labels to follow the diet that’s right for you. 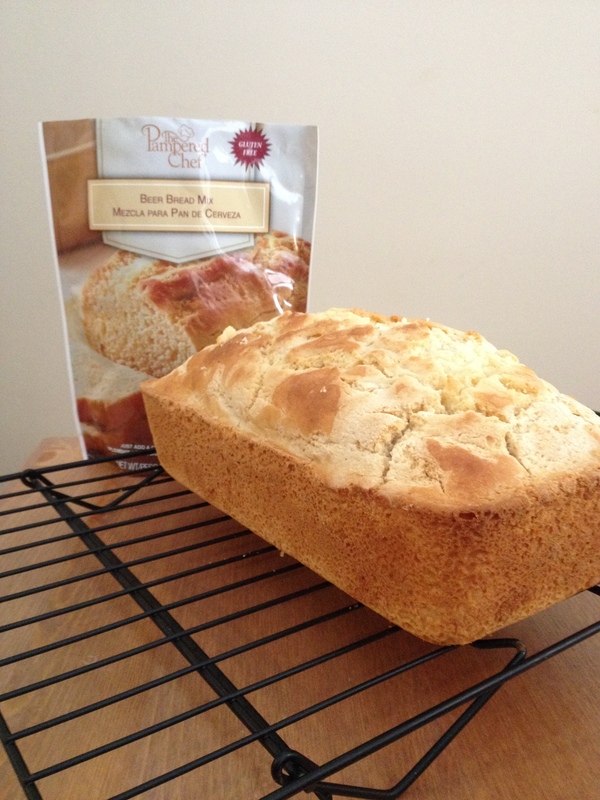 Instead of serving rolls, I made a gluten free beer bread, courtesy of Pampered Chef. Instead of using beer, I added an Angry Orchard Crisp Apple Hard Cider. I made this a day in advance to free up the oven and boy did that cider make the house smell good! This is definitely a mix I’d use again in the future — so simple and so delicious! 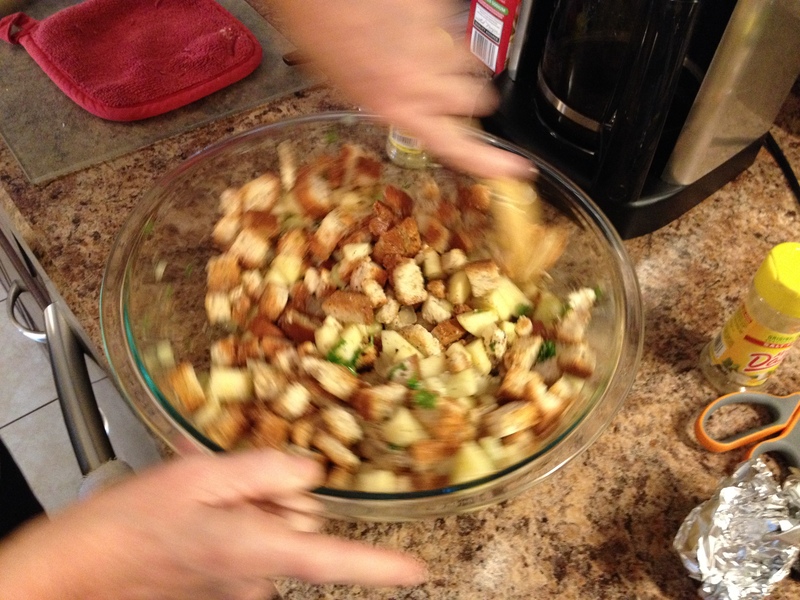 We actually made two different types of stuffing: a homemade recipe we concocted at the last minute to keep our turkey from getting dry and a boxed mix by Trader Joe’s. Both turned out pretty good, although the Trader Joe’s mix had a lot more flavor. Although this wasn’t my favorite dish on the table this year, it turned out pretty good! We tried Betty Crocker’s recipe, using crumbled Lay’s Sour Cream and Onion chips instead of making our own fried onions. Definitely a time-saving short cut! This is a dish my mom has been making for years, but unfortunately it calls for cream of celery soup. I couldn’t find a gluten free version in stores anywhere, so we adapted the recipe to make our own. This is a keeper! Although this isn’t a traditional Thanksgiving dish, it was a flavorful addition to our spread and gave our plates some holiday color! This is a special recipe my grandma saw on the news several years ago. Before the soufflé started making a regular appearance at the Thanksgiving table, very few members of my family ate sweet potatoes. This recipe is AMAZING. If you’re not a fan of pumpkin pie (like myself! ), this could definitely be your dessert. If you live in the Chicago suburbs, you have to try Sweet Ali’s! Sweet Ali’s is a completely gluten free bakery located in Hinsdale, although some of their items are sold in stores like Mariano’s and Fruitful Yield. It’s definitely worth paying money for Sweet Ali’s if you’re craving anything sweet — cupcakes, cookies, brownies, and pies. Fruitful Yield consistently stocks 4-packs of their cupcakes for around $12 and they offer a variety of flavors, including carrot cake, chocolate, vanilla, salted caramel, red velvet, and their seasonal flavor – pumpkin! The cupcakes’ cream cheese frosting is a perfect addition to a surprisingly moist gluten free baked good. Although both sides of my extended family are sweet enough to try cooking gluten free, inevitably mistakes happen. Even well-intentioned family members can accidentally add a wrong ingredient or use the same cutting board to cut the vegetables as they do the bread. Preparing a meal in advance allows me to (1) eat safely and avoid spending my holidays sick and (2) enjoy the same traditional holiday dishes that the rest of my family is eating. After sharing our plan with my mom, she offered to host my first gluten free Thanksgiving, allowing me to plan the menu and supervise the kitchen while we cooked the meal together. It was an exciting experience! Neither of us had ever cooked a turkey (by the way, stuffing a turkey was traumatizing!) and there was a lot of experimenting to adapt traditional gluten-filled favorites to dishes that would be safe for me to eat. Nevertheless, dinner turned out fantastic. She even offered to host again next year! Several news sources recently published articles on a subject I feel quite strongly about: if you aren’t under the supervision of a medical professional while following a gluten free diet, you might be doing yourself more harm than good. One of the reasons individuals should seek the care of a medical professional prior to starting a gluten free diet, especially if they suspect Celiac or a gluten sensitivity, is that gluten hides in so many foods, drinks, and even toiletries or medicines. It’s important to make educated decisions that will benefit your wellness when following any kind of diet. A New Name for the Gluten Free Diet? The problem with going gluten free as a fad diet is that the attention and controversy it has created takes away from the seriousness of the reason some must follow it. Alice Bast, Founder of the National Foundation for Celiac Awareness, wrote an article for the Huffington Post that gave an interesting perspective on the gluten free phenomenon: maybe we should stop calling it a diet and call it a prescription or regimen. In her article “Gluten: Here, There and Everywhere,” Bast argues that a gluten free diet is our prescription because the only cure for Celiac Disease is to follow a strict, life-long gluten free diet. I think Bast is right — a new name might deter people from following an eating regimen not meant for them or following the regimen without seeking medical advice first. For someone with Celiac Disease, anything ingested must be gluten free, including medicines. One of the best resources my dietitian shared with me after my diagnosis is a website called glutenfreedrugs.com. Maintained by a clinical pharmacist, this site offers a list of gluten free drugs that is 24 pages long! Two recent experiences led me to believe that this website might not be very well-known. If you haven’t heard of it, I highly recommend you use it. It might save you the headache of hunting down the manufacturer directly! I went to the eye doctor for a yearly check-up and mentioned that my eyes had been watering constantly. I thought it was allergies, but my doctor said I had an infection. She wrote me a prescription and sent me on my way. Right before I walked out the door, I remembered to ask if it was gluten free. My doctor actually looked a bit panicked and I don’t blame her. She isn’t a pharmacist or the drug manufacturer and I’m guessing she doesn’t hear that question often. I told her about glutenfreedrugs.com and she was able to verify the prescription would be gluten free, even noting on the script which manufacturers the pharmacy should use. I went to the pharmacy this morning to pick up a refill of this prescription. At checkout, the pharmacy tech warned me that the pill might look a bit different because they had to switch manufacturers. I immediately asked if it was gluten free, explaining that I had to follow a medical gluten free diet. She looked more panicked than the doctor! She grabbed the bottle off the shelf, but of course it wasn’t labeled gluten free. She went to the computer to look up the previous manufacturer, asking the pharmacist if she knew. Both seemed unsure, so I mentioned glutenfreedrugs.com, pulling out my phone to find the website. Thankfully, this manufacturer was also listed on the website as gluten free. You must advocate for yourself when following a medical gluten free diet. Having a proper education and access to resources can empower you to live a happy, healthy gluten free life. Thanksgiving is right around the corner and this holiday holds special significance for me as an individual with Celiac Disease. Last Thanksgiving was the last time I had a gluten-filled holiday. I remember eating all of the traditional Thanksgiving, gluten-y foods: stuffing, gravy, green bean casserole, and even turkey-shaped sugar cookies. The food was so yummy, but I’m confident a stomach-ache followed. Looking back, I remember how nervous I felt about my “last meal” before the big procedure. Friday, November 29, 2013 was the day of my endoscopy. A few days later, my diagnosis was confirmed. When my doctor called with the news of my diagnosis, it was after 7 p.m. My husband and I were having chicken fajitas for dinner, one of my favorites. I had eaten two of my three fajitas when the phone rang. My conversation with the doctor lasted about 20 minutes as he explained the results of my endoscopy and answered my questions. After hanging up, I walked back into the dining room and offered my leftovers to my husband. That night, I went gluten free cold turkey and haven’t had it since (well, at least not on purpose). Technically speaking, Thanksgiving stands as a marker of my one year anniversary with Celiac Disease. I have mixed emotions about this. I’m happy that after years of suffering I finally live a healthier life. I’m thankful that the fix to my problem is quite “simple” and that a fix exists at all. At the same time, I’m sad that I can’t enjoy foods I used to love. Yet, I’m excited when I find a new gluten free item that replaces the gluten-filled ones and even more excited when the price isn’t too high. I’m annoyed when others offer me gluten-filled foods, regardless of whether they know about my disease or not, because I have to say “no” when I really want to say “yes.” I feel guilty when family or friends offer me a meal that I honestly don’t want to eat because I‘m the one who suffers from mistakes made. I’m frustrated when I’ve been glutened and I can’t figure out what has caused a reaction that has intensified ten-fold since being gluten free. I imagine that I’m not alone in feeling these emotions because receiving a Celiac Disease diagnosis and adopting a gluten free diet is life-altering. That said, my pity party is over. Time to start planning my first gluten free Thanksgiving! Stay tuned for details, and if you have gluten free holiday recipes, I’d love for you to share them! If the option is available, try dining at a dedicated gluten-free facility because it eliminates any concerns of cross-contamination and makes for a stress-free dining experience. Using the Find Me Gluten Free app, you can locate these dedicated gluten-free businesses. If there’s a bright side to my much delayed Celiac diagnosis, at least it happened right after my husband and I moved to the Chicago suburbs. Living in such a populated area has given me the opportunity to be choosy when it comes to where I grocery shop and where I dine. One of my favorite gluten free restaurants is Cassava, and if you live near Chicago, I highly recommend you check it out! 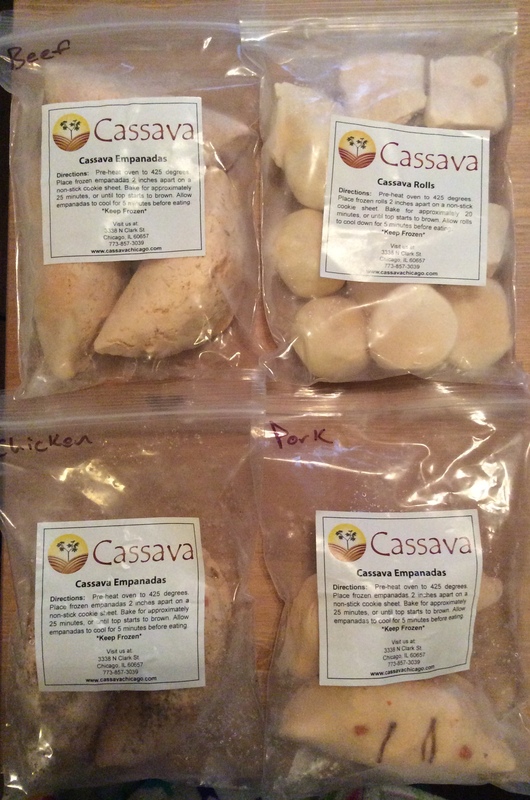 Cassava is located in Lakeview near Roscoe and Clark. Prior to eating at Cassava, I had never heard of the word nor did I know it was something you could eat! 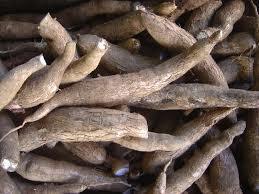 Traditionally grown in South America, Cassava’s roots have a lot of nutritional value. If you’re not convinced that cassava can be consumed safely, especially for those on a gluten free diet, perhaps the University of Chicago Celiac Disease Center will change your mind. Dedicated to researching a cure for Celiac Disease, the University of Chicago Celiac Disease Center presented Cassava (the restaurant) with an award back in 2013 for their safe, gluten free dining options. Cassava sells freshly baked, gluten free empanadas or cassava rolls and hot beverages or fruit smoothies. Although the restaurant has a small dining room, my husband and I usually place an order to go because Cassava offers frozen empanadas or rolls at a discounted rate. These items can be stored in your freezer and reheated in the oven at a time that is convenient for you. At just $2.85 per empanada and $6.95 for a dozen rolls, I stock up each time we visit the city. They are perfect for on-the-go meals and I usually take them for lunch. Typically one empanada and two rolls are filling enough for me. If you’re looking for breakfast, try the bacon, egg, and cheese empanada. It offers the best combination of your favorite breakfast foods. If it’s lunch or dinner time, I highly recommend the chicken. This empanada is filled with cheddar cheese, sweet potatoes, and peppers. It’s delicious! For dessert, definitely try the apple and cinnamon. Filled with dates and brown sugar, this empanada reminds me of apple pie. My favorite rolls are the cheddar and jalapeno or chocolate, but no matter which type of roll you try, you really can’t go wrong! In addition to dining in or carrying out, Cassava patrons can also have their food delivered if they live in the city or the suburbs. Better yet, Cassava’s beef and cheddar empanadas are offered at certain grocery stores near Chicago! I’d definitely recommend visiting their restaurant to try several items from their menu, but when you’re craving Cassava and you can’t make it to the city, visiting the grocery store is the next best thing! Because their products are so accessible, easily stored for future consumption, and quick to prepare, I eat Cassava several times a month. It is by far one of the best discoveries I’ve made in the gluten free community. Next time you’re in Chicago, I hope you have the time to try it! Over the weekend, I read an article titled “Celiac disease: ‘a constant war with food and me.’” The article chronicled the diagnosis of a woman named Erin Shean who, like many individuals with Celiac Disease, went misdiagnosed and undiagnosed for years. However, what caught my attention was her claim that Celiac is “a socially awkward thing to have because so much of our society is based on eating.” I don’t know how many times I’ve expressed that same sentiment since being diagnosed almost a year ago. Celiac Disease can feel extremely inconvenient when trying to make plans with friends and family or stressful when you have to attend a formal event. Nothing makes me feel more panicked as a Celiac than when someone is impatiently waiting a reply to, “Well, you can have this, can’t you?” or “You can eat here, right?” The wrong answer to those questions can have disastrous repercussions. Most people don’t understand how complex that answer really is. Um… gluten? Gluten is probably in it, but will the label list “gluten” as an ingredient? No. It’ll say something mysterious like emulsifier, modified food starch, hydrolyzed protein, malt extract, caramel color, dextrin, etc. Some of these ingredients may in fact be gluten free but they can also contain gluten, depending on the manufacturer. Deciphering labels is a learning process and having to answer when people are expecting a quick reply can be challenging. Again, a complex answer. It’s great that they offer gluten free crust but that doesn’t guarantee that the other ingredients are gluten free or the preparation of that pizza will eliminate the possibility of cross-contamination. 3. My husband and I recently went to a wedding in Cincinnati. During the rehearsal dinner, my husband explained to the groom that I had food back at the hotel and I may not partake in the meal. In response, the groom handed me the menu. “Here, take a look,” he said. Apprehensively, I glanced at the menu which listed the following items: ribs, chicken, salmon, grilled pork chops, or the shrimp dinner. In theory, any of these items could be gluten free. For example, chicken by itself is gluten free, but is there gravy or a sauce drizzled over it? Is it marinated? Is it grilled alongside gluten-containing items or were the same utensils used to prepare the gluten free chicken as a gluten-containing item? These questions can’t be answered by looking at a menu. Last week, I attended the Food Allergy Wellness Summit, a four day online event featuring presentations by food allergy experts. In her session “Be Your Own Food Allergy Avenger: Managing Stress in Social and Living Situations,” Lara Holland offered some invaluable advice about ways to manage food allergies in a social setting, something I have often struggled with as someone still new to the gluten free diet. 1. Excuse yourself for a “bathroom break.” Instead, do one of two things: (1) if you’re near a grocery or convenience store, step out to buy yourself some snacks, or (2) ask to speak to the chef privately so you can explain your dietary restrictions without calling attention to your situation. 2. Eat a meal before you go so you won’t be hungry if you can’t eat. 3. Keep gluten free snacks handy in your purse or your car. 5. If you’re meeting friends or family, ask if you can pick the location. If they know you have dietary restrictions, they should understand and be happy that you’re taking on the responsibility of finding a place that can accommodate you. Social events can be tricky, especially when you’re trying to avoid the “socially awkward thing” that is Celiac Disease. How do you manage social events on a gluten free diet? At the Crossroads is dedicated to helping Celiacs transition to a healthy & happy gluten free life.